Cutaneous B-cell lymphoma is not a single disease, but rather a family of neoplastic processes characterized by a proliferation of malignant B lymphocytes. These lymphomas may arise de novo on the skin (primary cutaneous B cell lymphoma) or spread to the skin as part of a systemic disease (secondary cutaneous B-cell lymphoma). It is not possible to make this distinction based purely on histo-logic findings, and a systemic work-up is required in all of these patients in order to determine the extent of disease. The prognosis is greatly altered depending upon this extent. As subtypes of lymphoma correlate with clinical correlation, histologic findings, and prognosis, several of the most prevalent subtypes will be described individually. 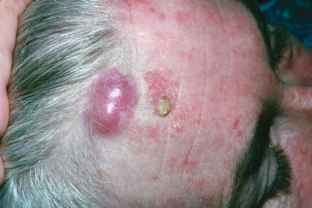 Marginal zone lymphoma (MZL) is reported to be the most common B-cell lymphoma that occurs in the skin. 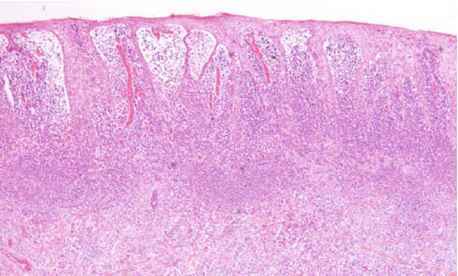 This type of lymphoma may be closely related to mucosa-associated lymphoid tissue (MALT) lymphomas. There is a slight male predominance and the mean age of onset is approximately 50 years (1). The usual presentation is that of one or several red-brown papules or nodules, most commonly on the upper extremities or head and neck (Figure 2.1). 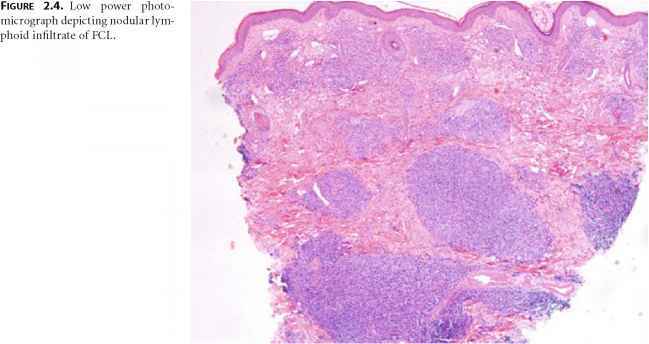 Histologic findings include diffuse infiltrates of lymphocytes within the dermis and subcutaneous fat. A Grenz zone is present in most cases (Figure 2.2). The lymphocytes are often admixed with scattered plasma cells and plasmacytoid cells, which provide a clue to the diagnosis (Figure 2.3). In more than 75% of cases, reactive germinal centers may be present, often masking the diagnosis (1). Areas containing a relatively monomorphous infiltrate of plas-macytoid lymphocytes constitute the neoplastic population. These marginal zones may demonstrate pallor at lowest magnification. This is often quite subtle, especially in early lesions. Rare eosinophils are occasionally present, further complicating the diagnosis. Figure 2.1. Erythematous nodule located at hairline biopsy showed marginal zone lymphoma. T cell infiltrate that may obscure the diagnostic population. The differential diagnosis mainly includes a reactive lymphoid hyperplasia. The presence of reactive germinal centers and plasma cells makes this distinction especially difficult. The presence of abundant plasmacytoid cells within greatly expanded interfollicular regions favors MZL, but this is not always apparent. In many cases, immunostains are helpful in detecting subtle light chain restrictions that reveal a clonal population not apparent with routine sections. Gene rearrangement studies are best reserved for cases in which there is a high degree of suspicion for lymphoma and when routine sections and immunostains are not helpful in arriving at a firm diagnosis (see Table 2.1). The prognosis for patients with MZL is excellent. Aggressive chemotherapy is not necessary. Local excision and/or radiotherapy have been used with a great deal of success. The five-year survival rate is >95%. Follicular cell lymphoma (FCL) occurs with approximately the same frequency as does MZL, but has a tendency to involve the head and neck, rather than the upper extremities. There is a slight female predominance for patients with FCL and these tumors occur most commonly in middle-aged adults (3). The most common presentation is that of one or several papules or nodules. There may be some clustering of lesions. The histologic changes in FCL can be separated into several histologic patterns. 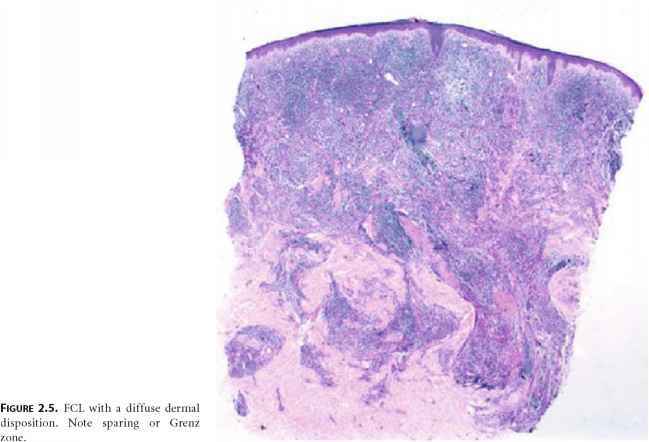 Similar to the subtypes seen in node-based FCL, the neoplastic infiltrate can involve the dermis diffusely or with a tendency to form neoplastic follicles (Figure 2.4). Figure 2.2. MZL demonstrating a dense dermal lymphocytic infiltrate separated from the epidermis by a Grenz zone. large, round or cleaved, similar to the appearances described in the nodal counterparts to this family of lymphomas. More commonly, however, FCL does not demonstrate a follicular growth pattern. Rather, the most common appearance is that of a diffuse, dense infiltrate of a uniform population of lymphocytes coursing though the dermis and the subcutaneous fat. There is no tendency for involvement of the epidermis or appendageal epithelium, and a Grenz zone may be present. Plasma cells and eosinophils are usually not present in FCL (Figures 2.5 and 2.6). Positive for clonal population in most cases. Figure 2.6. FCL with a monomorphous infiltrate of relatively small lymphocytes and lack of eosinophils or plasma cells. Immunostains reveal the infiltrating lymphocytes to express CD79a and CD20. Most T cell markers are negative, but coexpression with CD43 has been described in FCC. Light chain restriction is found in some cases, but lack of any light chain production is also common in primary cutaneous FCL. Bcl-2, a good marker for node-based FCL, is seen only in a minority of cases of primary cutaneous FCL; further, as this marker is constitutively expressed by T lymphocytes, interpretation may be difficult in dermal infiltrates (4). The major differential diagnosis includes cutaneous lymphoid hyperplasia. The presence of histiocytes, plasma cells, and eosinophils favors a reactive process, as does heterogeneity in the size and shape of the lymphocytes. In many cases, immunostains are helpful in demonstrating large sheets of B lymphocytes. The presence of significant numbers of B lymphocytes in the skin in any pattern other than confined to a reactive germinal center is concerning for lymphoma. As is the case with MZL, patients with primary cutaneous FCL have an excellent prognosis and aggressive systemic chemotherapy is not required. 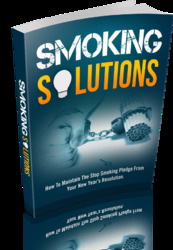 The five-year survival rate exceeds 95% (5). This is a controversial form of B-cell lymphoma that involves the legs of elderly patients. Some investigators believe this subtype of lymphoma to be a variant of FCL. Others cite differences in histologic pattern and overall survival in supporting the contention that this should be considered a separate subtype of lymphoma (6). The clinical presentation is that of one or several large erythematous to violaceous nodules with occasional ulceration in a linear distribution on a lower extremity. Bilateral involvement occurs in some cases, but rarely do tumor nodules extend beyond the lower extremities at the time of initial presentation. 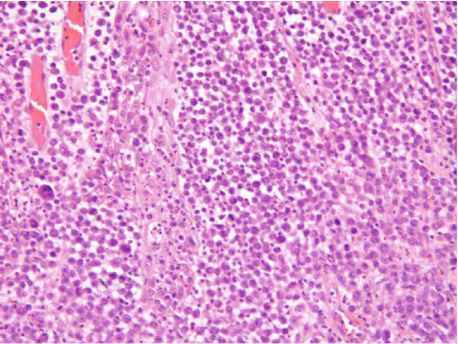 This subtype of lymphoma may be more common in women (6). 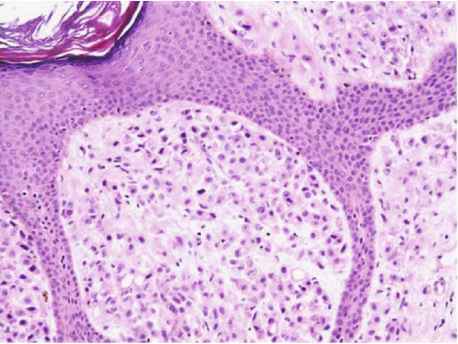 The histologic appearance is that of a diffuse infiltrate of large, atypical cells filling the entire papillary and reticular dermis. There is no tendency for involvement of the epidermis and a Grenz zone may be present. The tumor cells are large, with vesicular nuclei, occasional nucleoli, and abundant cytoplasm (Figure 2.7). Mitotic activity may be brisk, and individual cell necrosis is common (Figure 2.8). Figure 2.7. 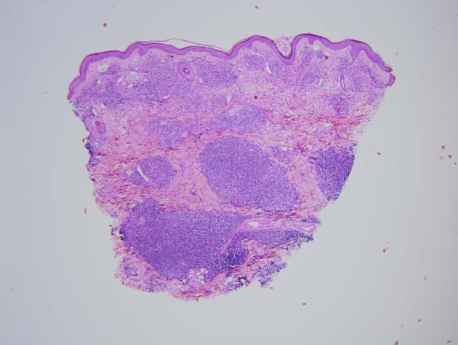 Large cell lymphoma is characterized by a dense dermal infiltrate for epidermotropism. Immunostains demonstrate CD20 and CD79a expression by the neoplastic lymphocytes. Light chain restriction is seen in many cases, though in some cases there may be no light chain production. The neoplastic cells in large cell lymphomas all variably express bcl-2, CD10, and bcl-6 (7). 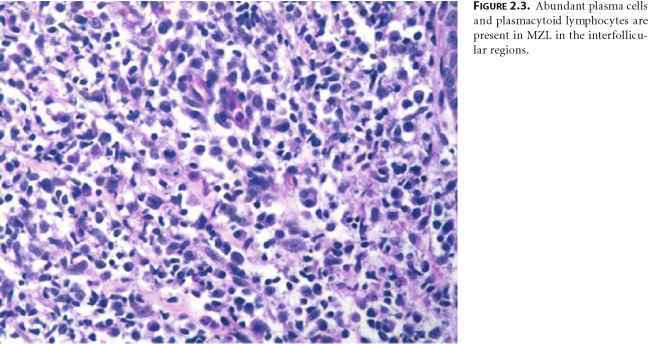 The main differential diagnosis includes large cell anaplastic lymphoma. This type of lymphoma is a T cell lymphoma in which the great majority of neoplastic lymphocytes express CD30. Immunostains make this distinction straightforward in virtually all cases. Figure 2.8. 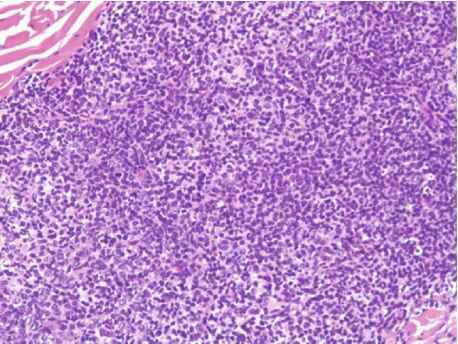 Large cell lymphoma shows large lymphocytes with vesicular nuclei, abundant mitoses and individual cell apoptosis. The prognosis tends to be much worse for patients with this type of lymphoma than for the very favorable FCL (7). If considered a distinct subtype, it is classified as an intermediate grade lymphoma (6). This extremely rare subtype of CBCL was previously known as malignant endotheliomatosis based upon its histologic appearance. (Immunostains have subsequently proven that the tumor cells are not endothelial in nature, but rather, are B lymphocytes (8,9). Exceedingly rare cases are T cell lymphomas (10)). Intravascular lymphoma (IVL) affects primarily elderly adults who present with a diffuse hemorrhagic cutaneous eruption and signs of central nervous system thromboi. They are generally acutely ill at the time of presentation and require immediate clinical intervention. The histologic features include a proliferation of large, markedly atypical lymphocytes that are confined almost exclusively to within vascular spaces. The tumor cells display little tendency to extend beyond vessels, and in most cases, the dermis is completely devoid of lymphomatous infiltrate beyond the vessels. Affected vessels are significantly distended and occluded by the neoplastic cells, and signs of infarction may be present. Immunostains reveal that the large tumor cells are CD20+, CD79a+ B lymphocytes. In most cases, there is not sufficient cellularity to attempt demonstration of light chain restriction. The major differential diagnosis is metastatic carcinoma within lymphatics. Immunostains are helpful in making this distinction in virtually all cases. The prognosis for patients with IVL is very poor. Mortality rates exceed 80% and the mean survival has been reported to be about 13 months (11). Many of these patients succumb to consequences of ischemic episodes within the central nervous system caused by occlusion of these vessels by tumor cells. Rapid cytoreductive therapy is required, but rarely does this result in long-term survival.